Need To Know About New OSHA Silica Dust Rules and Regulations? The U.S. Department of Labor first emphasized the life-threatening hazards of respirable crystalline silica in the 1930s. Today, according to OSHA, approximately 2.3 million Americans are exposed to silica on a regular basis in the workplace. Heavy equipment operators, construction, and plaster/drywall workers are the most at risk to being exposed to silica. The most severe exposures to crystalline silica result from abrasive blasting. Additionally, exposures may occur in cement, brick, and asphalt pavement manufacturing, ceramic manufacturing, and the steel and foundry industries. Inhaling silica dust causes silicosis and lung cancer. The symptoms of silicosis include shortness of breath, chest pain, and difficulty in breathing, however, this illness can show no symptoms for many years. These non-reversible lung diseases are the target of the new OSHA silica regulation. On March 2016, OSHA issued a FINAL RULE to protect American workers, limiting their exposure to respirable crystalline silica. 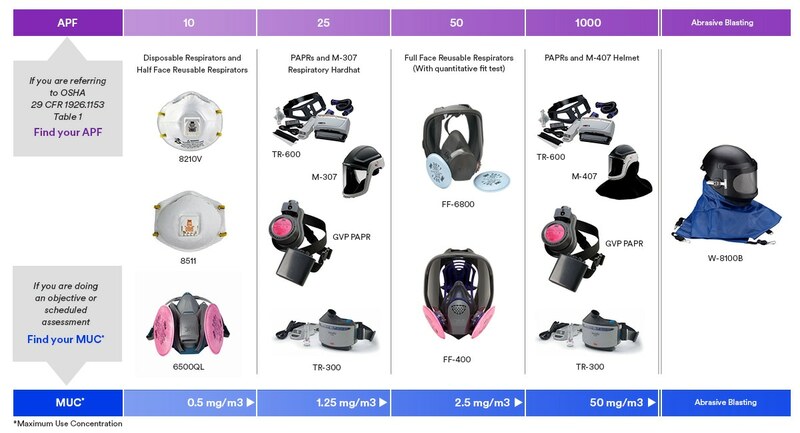 Sets a new PEL (permissible exposure limit) for respirable crystalline silica to 50 micrograms per cubic meter of air, over an 8-hour shift. Requires employers to use engineering controls (such as water spray systems or ventilation) to limit workers exposure to the PEL; provide respirators when engineering controls are not able to eliminate exposure; limit worker access to high exposure areas; develop a written exposure control plan, and train workers on silica risks and on the ways to limit the exposure. Employers must support and provide the means for potentially highly exposed workers to obtain medical exams to monitor their health in relation to the exposure. Construction - September 23, 2017. General Industry and Maritime - June 23, 2018. Hydraulic Fracturing - June 23, 2018, for all provisions except Engineering Controls (a compliance date: June 23, 2021). The implementation of this rule will prevent about 900 new cases of silicosis each year, and save 600 lives. How do you know if you are providing enough protection? Talk to us at 800-829-9580 or visit us online Pksafety.com. We have PPE to help you protect your crew and keep your company compliant.